Our company is the leading producer of ribbons used for flowers and decorative ribbons in the Polish market as well as one of the biggest producers of this industry in Europe. Our ribbons used to decorate flowers and gift-wrapping are available in a very wide range and full color palette. You can find hundreds of ribbon designs in several basic groups ranging from polypropylene, woven ribbons and material, to finesse and multilayered lace, and a grid of original decorative stitches, papers, decorative foils and strings. BELATEX ribbons are characterized by their decorative and utility values. 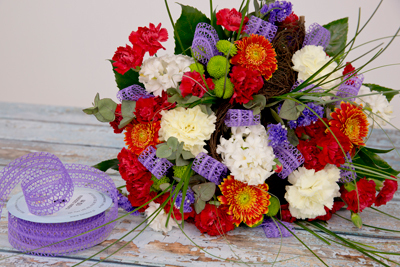 Properly selected and effectively pinned, they emphasize the beauty of flowers, flower arrangements and gifts. They are also widely used in the design industry as decorative elements in shop windows during the Easter and Christmas holidays, churches and banquet halls during wedding celebrations and communions, and the sashes an invariable accessory to the common funeral wreath. Our product catalog presents a variety of collections of decorative ribbons and tapes for occasions such as Easter, Christmas, Valentine’s Day, weddings, communions, and funerals. Moreover, we offer a very rich collection of everyday ribbons. Click here to close this information.